Chucho has had to rebuild his trust in humans after being abandoned in a backyard, but is ready to be someone’s best buddy and playmate (submitted photo). Abandoned in a backyard after his owner moved away, Chucho understandably has had to rebuild his trust in humans. The 6-year-old Labrador retriever mix has worked with Arizona Humane Society Behavior staff since being rescued in December of last year. In the short amount of time in the shelter, Chucho has made improvement in everything from learning how to walk on a leash and to enjoying being petted. Chucho is a sweet pup who can be a bit shy when meeting new people but turns into an adorable baby after he spends time with you. The lovable doggo also enjoys playing with all kinds of toys, especially tennis balls. 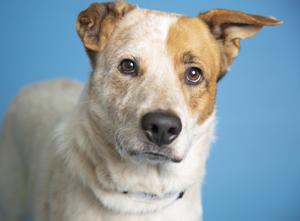 Visit the handsome Chucho at the Arizona Humane Society’s Sunnyslope Campus, located at 9226 N. 13th Ave. His adoption fee is $350 and includes microchip and vaccinations. For more information, call 602-997-7585 and ask for animal number 595098. Please note: This pet might have been adopted by the time you visit the shelter, however AHS has dozens more wonderful pets who also need loving homes. To see all adoptable animals right now, visit www.azhumane.org/findapet.